For a number of (mostly health) reasons, this has seemed like a really, really long winter that will just not end, and I am hanging out for the warmth and the sun. Prompted by Jennifer L Scott’s (author of Lessons from Madame Chic: 20 Stylish Secrets I Learned While Living in Paris ) latest you tube video talking about planning ahead for your next season’s wardrobe, I thought it would be the perfect time for me to re-evaluate, and look towards my spring summer capsule wardrobe. 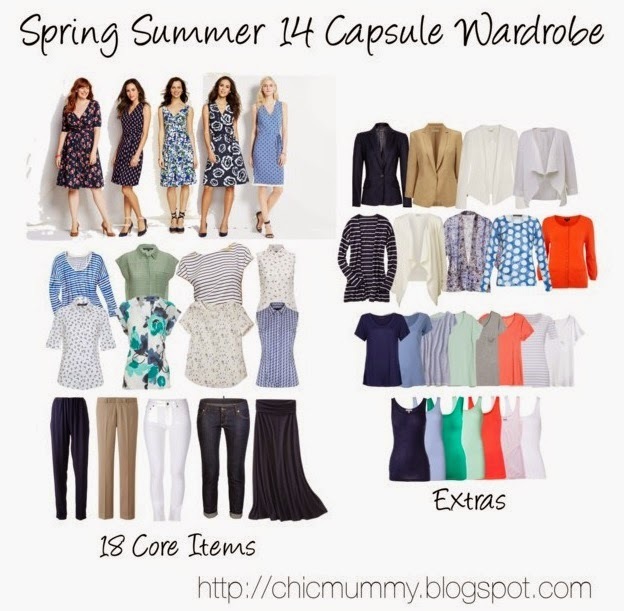 The first thing I like to do when deciding on my capsule is to decide on the colour palette. I think this is a really crucial step when you are limiting your wardrobe – you need to choose colours that suit you, go together AND that appeal to you. Despite what some experts may say, I think all three elements are equally important. It is no point having a wardobe of colours that suit you if they don’t go together, and similarly, what could be more depressing than looking at a sea of flattering, well co-ordinated colours every day that you simply. cannot. stand! 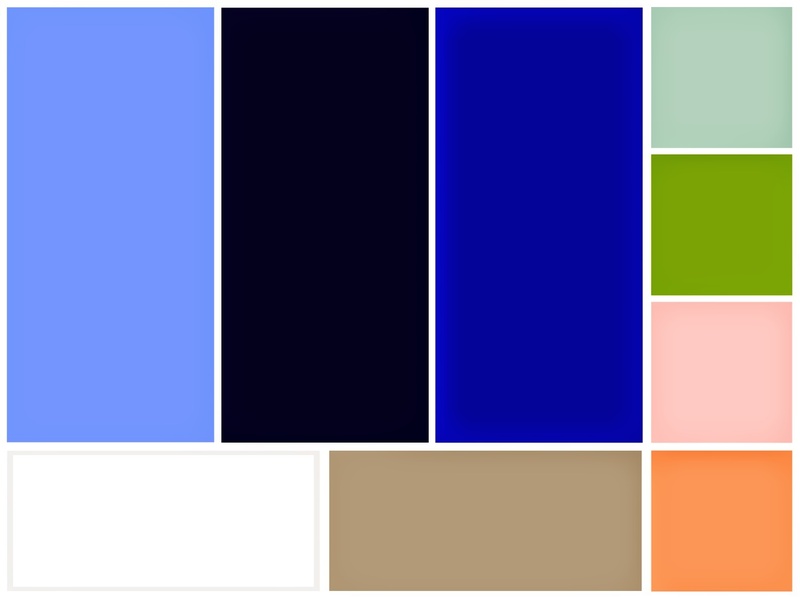 I use the wonderful blog Into-Mind’s philosophy for developing a colour palette – you choose three core colours (in my case periwinkle, navy and cobalt), two neutrals for support and balance (white and tan) and four accent shades to add variety (celadon, apple, rose and coral). I’m still using a variation on the ten item wardrobe concept, as defined by Jennifer L Scott in her fab book, and I’ve found that 18 core items seems to be the magic number for my wardrobe (tees, cardigans, blazers all count as “extras”). I could absolutely get it down to 10 if I had to, but the concept is meant to be a flexible guideline and not a rigid set of rules, and I find that 18 items seems to be the right balance for my laundry habits and to suit the wide variety of weather we get over a spring/summer. The items will change slightly as we move out of spring, and head into summer proper. Here in Perth, Australia we have spring weather that can range from cool and rainy to really quite hot, but as we move into summer we head into heatwave territory, where the average temp is over 35C (95F). As such, the sweaters, most of the cardigans and almost all of the blazers will get packed away, and in will come a couple of pairs of shorts. This time around I though I would show you how you can take one piece through 3 levels of dress, from 1 – casual, 2 – chic and 3 – elegant. The first outfit, level 1 casual, is what I call my base level of casual, the level at which I would be happy to leave the house in. It’s the type of outfit for weekends watching the kids play sport or going to the park with them. It’s pretty simple but still comfy; a tee, flip flops and a pair of khakis, but made stylish by upgrading the flip flops to a leather pair, using a leather trimmed tote and adding in a cool cuff. The next outfit, level 2 chic, is the type of outfit you would see me in most days. It’s still simple and comfy but kicked up a style notch. This is what you would see me in if you bumped into me running errands or picking up the kids from school. With this particular outfit, I’ve gone for a bit of pattern mixing, making it easy by keeping the colours the same, navy and white. The shirt looks great on its own if the day warms up and the flats are super comfy for running around in. Adding a roomy tote and some simple jewellery completes the look. The last outfit, what I describe as level 3 – elegant, is probably the most dressed up I get on a (semi) regular basis. I would wear this level for a parent teacher evening, a school concert, or a lunch out with the girls.The linen blazer is not too formal, and the statement jewellery is simple and elegant. 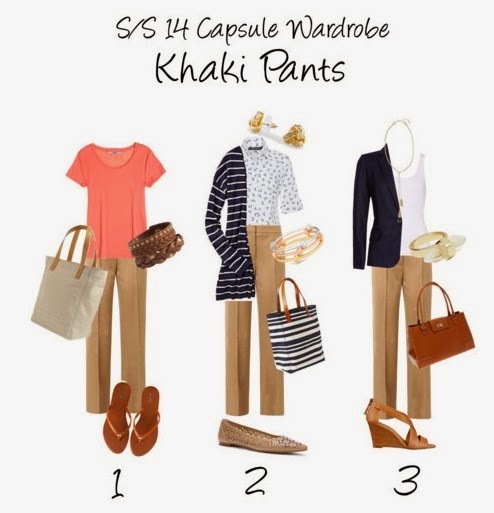 Using a navy pair of drapey pants (a new buy for this year), here are another three levels of outfits using the one item. Whether you are wearing level 3 on a date night with your husband, or watching the kids at swimming lessons in the level 1 outfit, you will look stylish and appropriate for the occasion. Finally, I’ve put together three more outfits using the capsule pieces, just to show how truly versatile a capsule can be. These are all outfits I plan on wearing through the season, and the nine outfits that I have shown you really just are the tip of the iceberg. 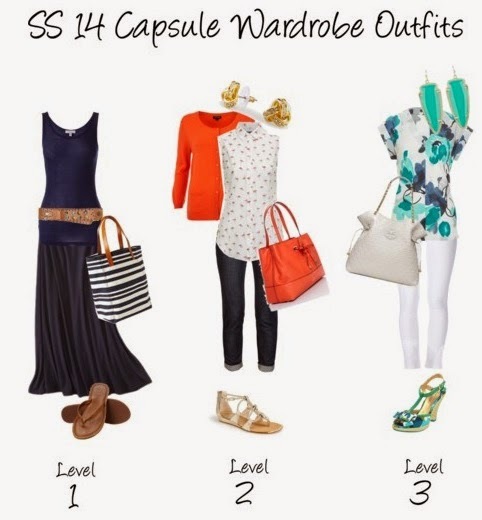 Even the outfits above can be taken up or a down a level simply by changing the accessories. Add in some heeled sandals and some jewellery to the navy maxi and singlet and you’ve moved from casual to chic. Swap the gold sandals for the brown leather flip flops, switch out the tote to a canvas one, and lose the jewellery, and you’ve taken the sleeveless shirt, jeans and cardi from chic to casual. These capsule wardrobe posts are some of my most popular, so I am planning more over the next few weeks, and please leave me a comment if there is something specific you would like me to cover!